Firestone - I Say Ding Dong Shop - Buy Stickers, Decals & Unique Automobilia. 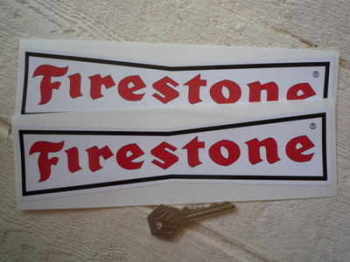 Firestone & Wheel Style Shaped Sticker. 5.5". Firestone 'Dicky Bow' Black & Silver Stickers. 6" Pair. Firestone 'Dicky Bow' Black on White Stickers. 10" or 12" Pair. Firestone 'Dicky Bow' Red & Off White with Black Letters Stickers. 10" Pair. Firestone 'Dicky Bow' White on Black Stickers. 4", 6", 8" or 10" Pair. Firestone 'Dicky Bow' with Black Letters Stickers. 18" Pair. Firestone 'Dicky Bow' with Black Letters Stickers. 5", 8", 9", or 10" Pair. Firestone 'Dicky Bow' with Red Letters Stickers. 9" Pair. Firestone Chequered Flag Sticker. 18". Firestone Chequered Flag Stickers. 3", 6" or 10" Pair. 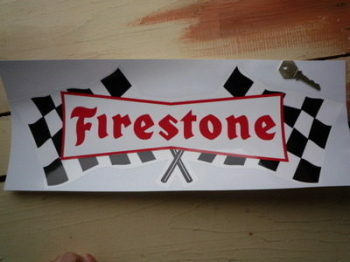 Firestone Chequered Flags Black Red & White Window Sticker. 4.75". Firestone Chequered Flags Red & Off White Window Sticker. 3" or 4.25". 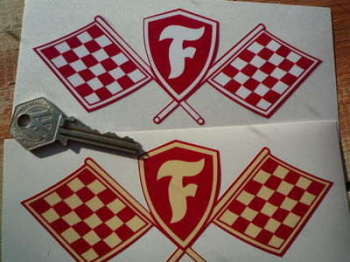 Firestone Crossed Flag & Shield Sticker. 5" or 6". 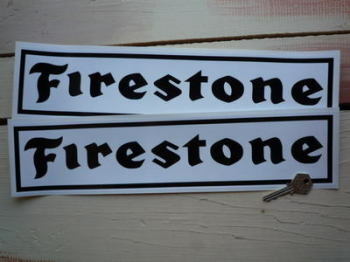 Firestone Cut Vinyl Text Stickers. 8" Pair. Various Colours. Firestone Dicky Bow Red on White Stickers. 4", 6", 8", 10" or 12" Pair. 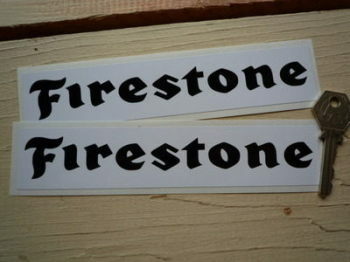 Firestone Oblong Black on White Stickers. 14" or 16" Pair. Firestone Oblong Black on White Stickers. 7" Pair. 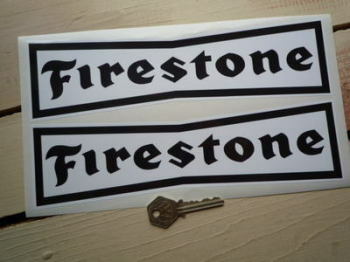 Firestone Oblong Black on White with Black Outline Stickers. 16" Pair. Firestone Oblong White on Red Stickers. 10" Pair. Firestone The Lampert Company Obolong Sticker. 8".